Why we do NOT recommend DampRid in a VACANT home | Homewatch Services Etc. Whenever I come across new information regarding vacant homes through education or personal experience, I like to share it with my clients. They can then decide how they would like to proceed. This particular blog discusses DampRid. My company does NOT recommend the use of DampRid in vacant homes or vehicles. I’m not saying that DampRid is a bad product. I believe it can be a useful product in a home that is actually being occupied, but not in a vacant home. 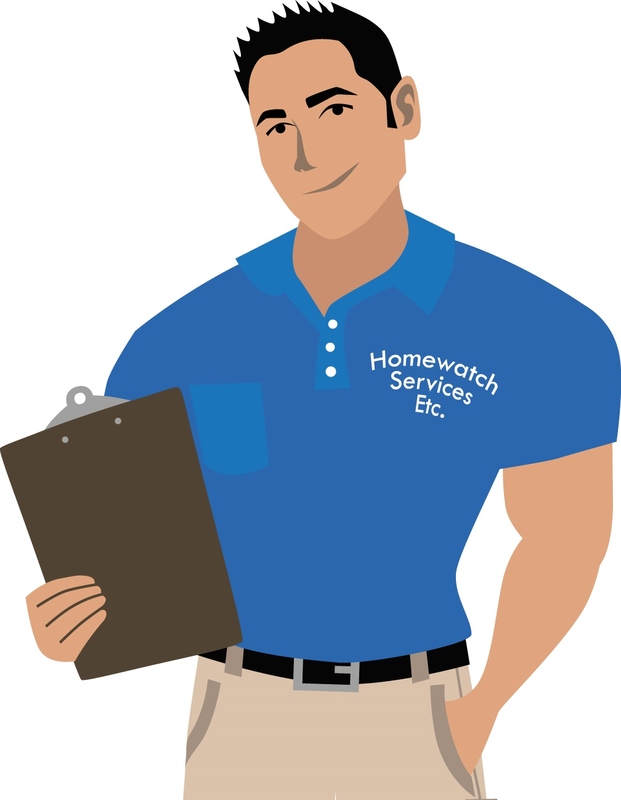 I’ve had the opportunity to speak with mold remediators, a mold inspector, HVAC professionals, and even other seasoned homewatchers like myself regarding DampRid. The consensus is NO DampRid in a vacant home! Let me share my thoughts with you and you can then decide for yourself. For some reason the use of DampRid has exploded for seasonal homeowners. Probably because on the DampRid refill bag it states, “Prevents mold and mildew stains.” and “Protects from moisture damage.” I’m surprised they would even boast such unrealistic claims. The average homeowner can easily be misled to think that DampRid is the cure to “prevent” mold in their vacant Florida home. 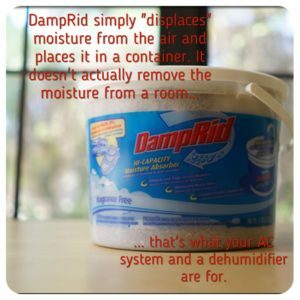 Yes…DampRid is designed to remove moisture from the air. By doing so, it helps reduce excessive humidity. It’s made up of an inorganic mineral salt called calcium chloride that absorbs moisture from the air. Humidity (moisture) has to be present for mold to grow in your home. That’s why you hear everyone saying “It’s not the heat…it’s the humidity.” Your Florida home can be 88°F and under 50% relative humidity and it would be just fine. Sure, it would be considerably hot, but you wouldn’t have a mold bloom. LARGE DampRid BUCKETS: DampRid does remove moisture from the air, however all it’s doing is moving the moisture from the air into a container. The DampRid containers are all open at the top. They are not sealed…if they were, then the moisture from the air wouldn’t be able to enter it. So now you have a container of liquid (moisture) just sitting in your vacant home or vehicle. What does mold need to grow, bloom, and spread? MOISTURE! The same moisture that you just removed from the air and that is now sitting in a container. You thought you were protecting your home, but instead you are unknowingly contributing to it’s potential demise. 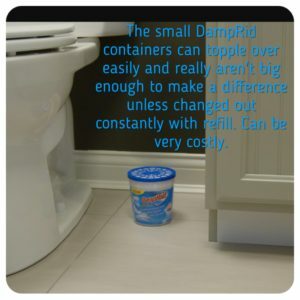 SMALL DampRid CONTAINERS: The small containers are a money pit! You have to keep refilling them with DampRid granules. They topple over easily, and if you have them in your carpeted bedroom closet, they can leave an unsightly oily looking stain on your carpet…I’ve seen it first-hand. 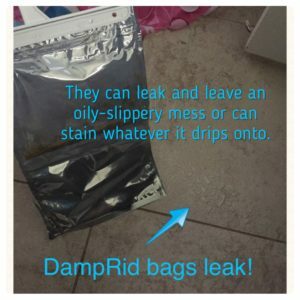 HANGING DampRid BAGS: I encountered leaked out DampRid bags at 4 different vacant properties I service. My clients would hang their DampRid bags in their closets, pantries, and even in vehicles. Unfortunately, they did not realize that the bags they used had a very small hole in them. Once the bags started filling up with moisture, it mixed with the DampRid granules and leaked all over the floor. Have you ever felt the DampRid liquid? It’s not water…it’s an oily substance. On tile floor it causes an oily-slippery mess, a slip-and-fall hazard, and is a pain to wipe up and clean. One of the DampRid bags leaked onto a client’s cloth backseat in their minivan; staining it with a large oily drip stain that they were not able to remove. SIDE NOTE: During our hot and humid Florida summer, your air conditioning system can remove anywhere from “9 to 22 GALLONS”of moisture from your home in 1 day. That is a LOT!!! Do you really think a small container of DampRid is going to make a difference? I’ll let you decide that. Make sure your air conditioning system is running properly so it will properly remove the moisture from your home. If you’re not confident in your A/C system, then consider adding a portable dehumidifier in your home with a hose setup to drain the water directly into a kitchen sink or shower floor drain. Set it around 50% relative humidity. 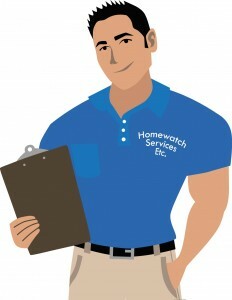 Keep a few of your ceiling fans running on low to help circulate the air. Consider installing a small wall A/C system in your garage. Consider having a ceiling fan installed so it can circulate the air. Consider having a sturdy box fan properly secured so it can circulate the air. You can set it up on a timer so it runs on low for maybe 5 hours a day. Make sure to plug it into a GFCI outlet. Consider adding a portable dehumidifier in your garage and program it to run when the relative humidity level gets over the desired humidity setting. Make sure to run the dehumidifier hose out of the corner of the large garage door. That way, the water can drain outside and not into the garage. Close all vehicle windows and engage your air recirculation button (to close the air intake door vent) before you turn off your vehicle. That way moist air from the garage doesn’t seep in through that vent. Have the interior of your vehicle thoroughly cleaned, wiped down, and vacuumed prior to leaving. That way you are not leaving behind organic material that can become a food source for mold.